How many people did we provide with a great vegan taste experience? 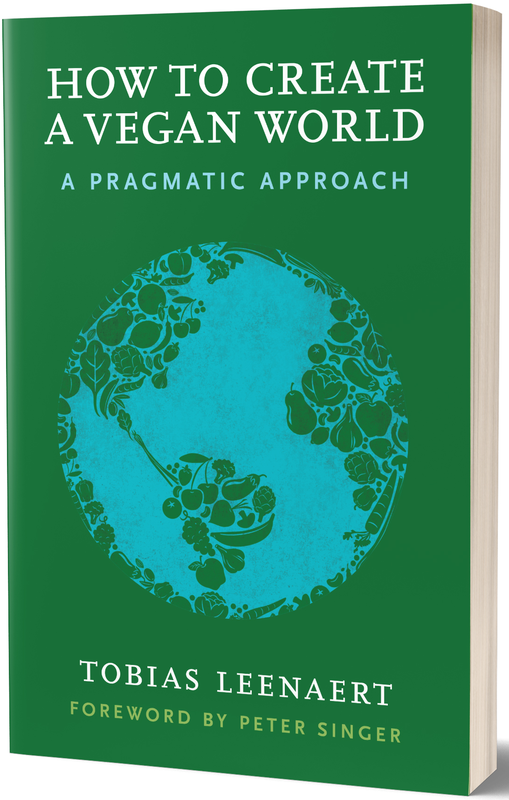 When people get the idea that vegan food can be good, there is a lot of chance they will be more open to arguments for veganism or to the idea that farmed animals matter (I’ve written about this on many occasions). Of course many people – vegans and non-vegans alike – buy vegan products in supermarkets or try vegan dishes in restaurants (or at home) every day. However, I’m talking about reaching the ones who are not prone to do this by themselves: people who might have prejudices against vegan food (that it’s boring, tasteless, too difficult to prepare etc). Given that they are not willing to spend money on veg products or dishes, how can we put something vegan in their hands and mouths? One way is what I have called stealth veganism before: simply not mentioning that a product, a dish or even a restaurant, is vegan, so as to avoid the prejudice. But let’s look at other options. 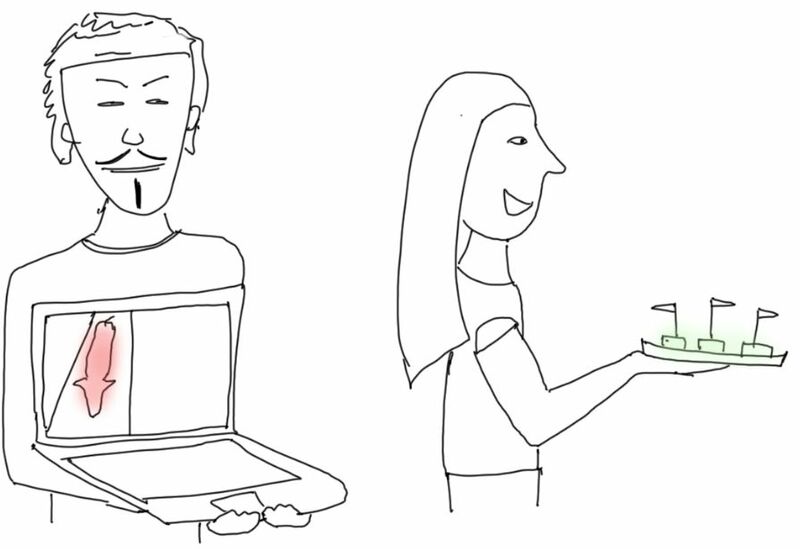 Providing people with a bite of something vegan is, of course, logistically more complicated than giving them a flyer, sending them an email, or making them watch a one minute video (the usual ways in which vegans do advocacy). You need to invest in the food, get it to the people, prepare it, serve it (and then ideally follow up to estimate the impact, and help them take further steps). While we can’t force-feed anything to anyone, there are several ways in which we can shorten the distance between the unwilling customer and a (great tasting) vegan product. If you look at it logistically, the easiest way, of course, is that the producers offer samples of their products themselves, on places where a lot of people come, shop or eat. That could be at a fair, a busy place in the city, or in restaurants and supermarkets themselves. 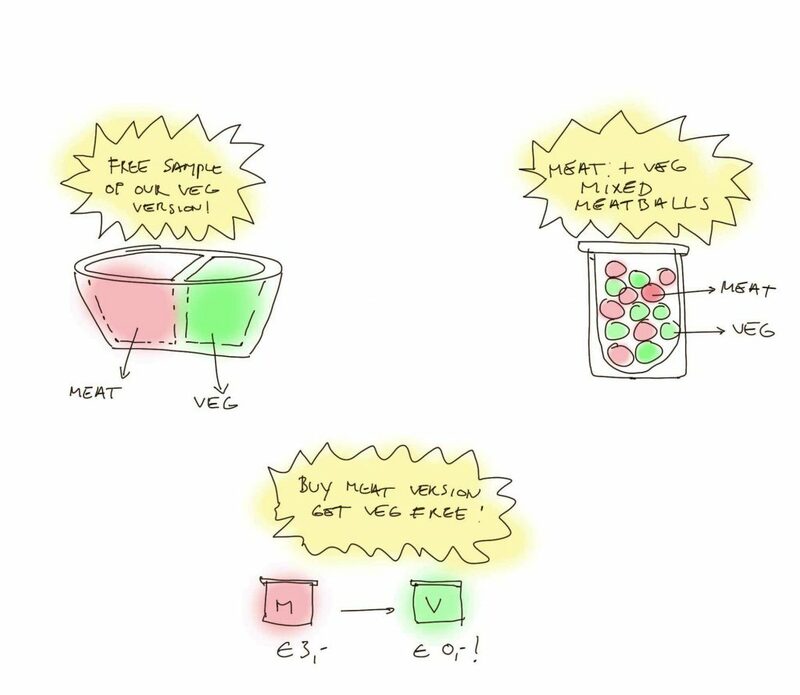 A producer (or store) wants to sell as much product as possible, so it makes sense that they get as many people as possible to taste their products, trusting that sampling will lead to more sales. All of this is very obvious, so let me offer you a couple of less obvious ideas for getting unwilling people to take a vegan bite. I recently heard about what I suspect is a particularly efficient setup to hand out samples: imagine a company cafeteria (or other restaurant), where customers have (every day or on certain days) the option to put a vegan dish on their tray, rather than a meat dish. By default, sales of the meat dishes would be much higher than the vegan sales. But if there would be people passing out samples of the vegan dish (or just of the meat alternative from that dish – e.g. a veg nugget) at the entrance of the cafeteria, while customers are waiting in line, the percentage of vegan dishes sold could be increased dramatically. The person (a representative from a company producing meat alternatives) told me up till half of the customers chose the vegan dish! Vegan advocates could do this work, but it could also be done by the people from the catering companies. The great thing is that if one or a couple of big catering companies (think Compass, Aramark, Eurest…) would roll out such campaigns, this would be a way to structurally cover a big part of the population. It could be done in schools as well as in company restaurants. On the meta-level, veg organizations lobbying with caterers to do this sort of thing, and maybe offering them a campaign framework like Meatless Monday or a meatless week or month, could potentially be quite impactful, especially if we’re talking to very large companies. I call a “mixed brand” here a brand or company that has both meat and veg products in their range. These companies have some means at their disposal to convince their own customers – who are already familiar with their brand – to try their new veg products. 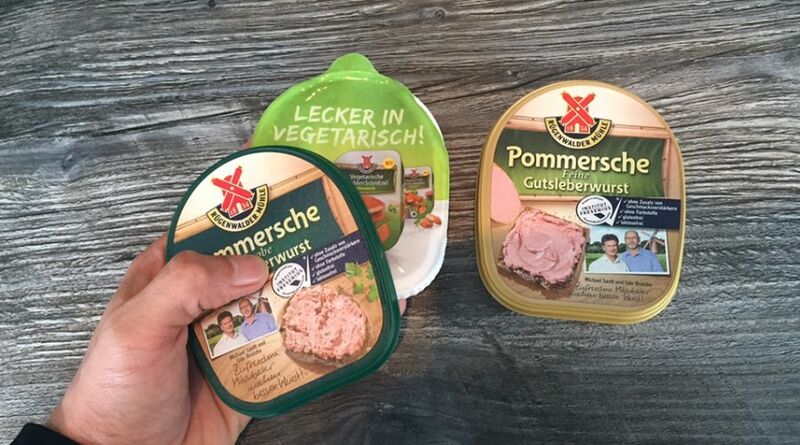 I’ve seen cases where the packaging of the meat product has an ad for a vegetarian variation, which you see when you remove the lid at home, like in this example, by the German company Rügenwalder. These ideas may obviously require some logistical efforts, and it’s easy to see that they are not directed at vegans, but I think there is a big potential here to reach unwilling customers where it matters: in the stomach. Companies might have very good reasons to try these tactics, as it becomes more and more important for them to gain a larger and larger foothold in the vegan market. An extra motivation might be that in some cases there could be a higher profit margin on the veg products. Also, consider the added value of a big, trusted brand. When meat eaters see a vegetarian version of a product they know and trust, they might be more likely to buy it than when it’s from a brand they’ve never seen before. A graph by market research company GFK that I recently saw (and which I’m not putting here for proprietary reasons), showed the market penetration (i.e. how many people had actually tried the product) of vegetarian sandwich slices in Germany. For the veg variation by a well-known meat brand, this was no less than 48%, while for one of the more well-known vegetarian brands, it was a mere… two percent! There are many vegan advocates in the street spreading moral messages to passers-by, by means of videos, flyers, and conversations. That’s great, but I think these interactions would be a lot more powerful if there was also the component of food sampling. A vegan nugget (probably one of the most convenient savory products to distribute) can be a conversation starter, can make people less defensive about discussing animal suffering (as they realize there is not all that much to lose), etc. I think that for the animal protection movement, there are possibilities to organize samplings on a much larger scale than we are doing today. Potentially, we could be giving out tens of thousands of vegan samples every day, in the street, at festivals and fairs, with or without any special occasion. Don’t tell them it’s vegan… at first. As labeling a product as “vegan” for now still seems to be a turn-off for many, it’s better not to talk about it from the get-go. Some alternatives to put on your signs or banners could be “Free, Sustainable Food”, or “Cholesterol Free Food”. Adapt to your audience. Once people have tried the food, you should ask them what they think of it. It’s important to get their reaction first, so they can’t change their mind later. People may be shocked, so tell them that most people can’t tell the difference. This will prevent them from getting upset, and reinforces the idea that vegan food can taste just as good as “normal food”. If you really want to make the biggest difference you can for animals or the planet, it’s important to help people buy the product for themselves. Keep your focus! You’re not talking about the benefits of veganism as a whole, or why someone should eat a plant-based diet in general (unless someone asks, of course). You’re just focussing on this one great product and why they should buy it. For many people, this could be their very first experience with vegan food. It’s really important that this moment is a happy, positive one that makes them walk away with a great memory. If the person doesn’t like the product, or has strong feelings about vegan food or veganism in general, so be it! Don’t try to change their mind. Hopefully they’ll change their own, in due time. There is great potential for structural partnerships with the producers of these products, where the vegan movement could become a structural partner for them, possibly even getting paid for the sampling services. Imagine how many vegan nuggets a group like Anonymous for the Voiceless, with many hundreds of chapters all over the world, could hand out! Do you know of any other ideas to close the gap between vegan food and reluctant eaters? Let me know in the comments!